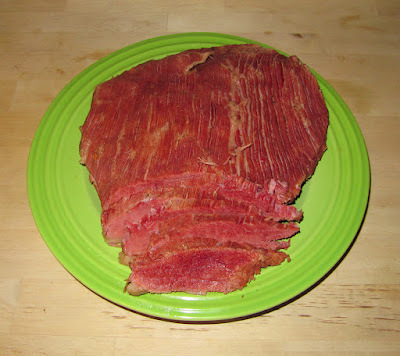 This past month's charcutepalooza challenge was brining, specifically beef brisket for corned beef. 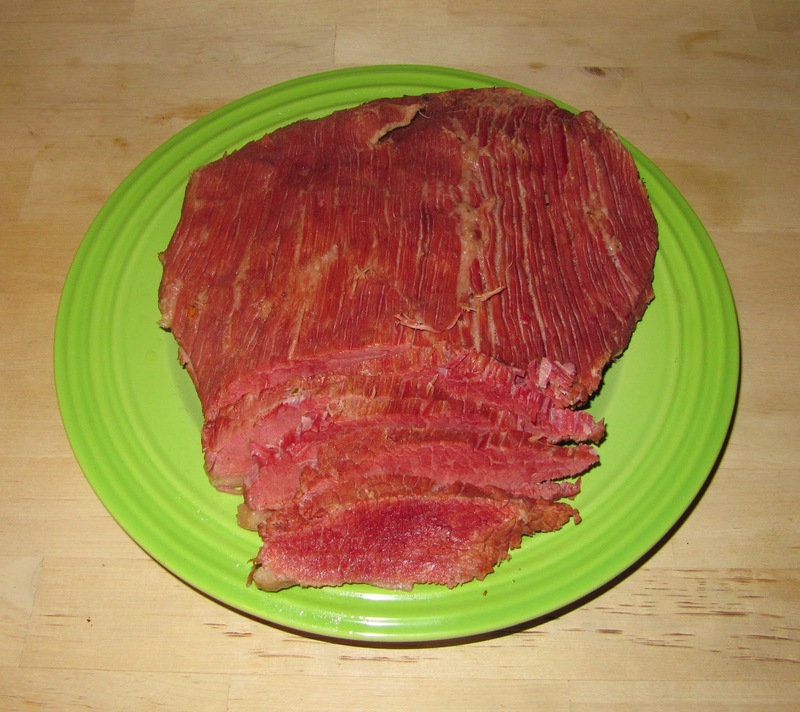 Though I knew I would be a few days past the challenge deadline I was glad that I would have corned beef ready for St. Patricks Day! 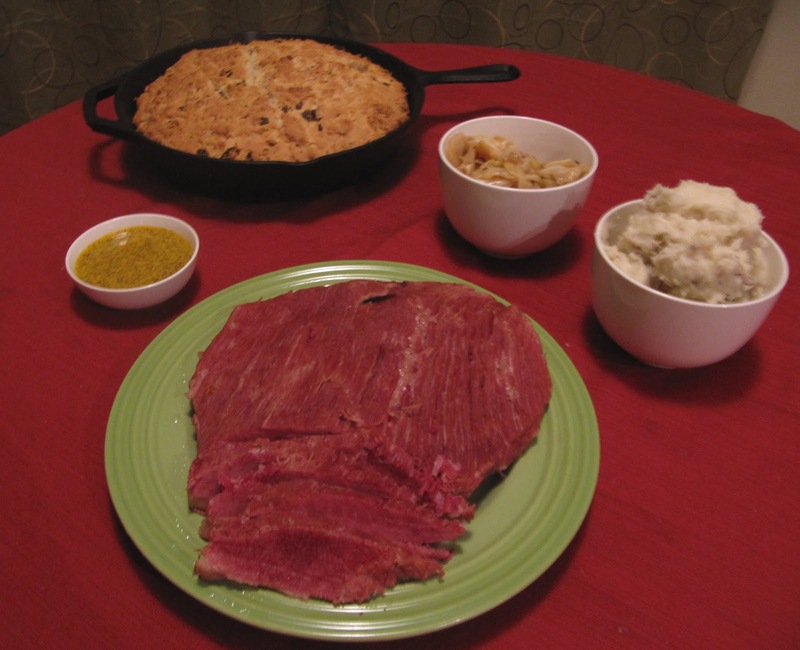 I've never really had a meal consisting of corned beef, cabbage, and potatoes so I knew I wanted to keep it traditional as I knew how. It started 5 days before St. Patrick's day. I had a very nice beef brisket I got from Paulina Meat Market here in Chicago and it was ready to be brined. In a large pot I combined water, salt, pink salt, crushed garlic and hot pickling spice and brought to a boil. I let the brine completely cool before adding the brisket. To make sure the beef was completely submerged I used a large 2 gallon ziploc bag, placed in a deep roasting pan and placed in the refrigerator. 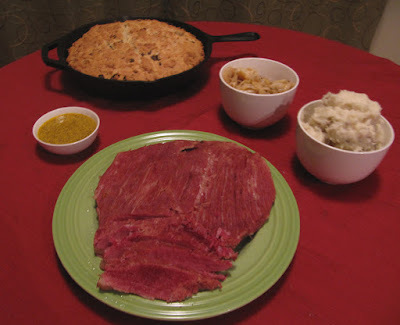 It was very difficult to see the corned beef day after day, I just wanted to cook it up and eat it! After a long 5 days, I was able to remove the brisket from the brine and rinsed it thoroughly. I placed the beef in a large stock pot, covered with water and added celery, carrots and onion. After simmering for 3 hours, the brisket was fork tender and looks gorgeous. To serve along with the corned beef, I cut up a head of cabbage and sauteed in combination of butter, onion, garlic and caraway seeds. I continued to cook the until it browned a bit then finished with a few splashes of vinegar to bring out more flavor. I also made whipped potatoes by taking russet potatoes that I boiled then combined with butter and cream, mixing at a very high speed until completely smooth. Finally, I made soda bread which was probably one of the simplest things breads I've made and has great flavor. I combined flour, baking powder, baking soda, sugar, salt and raisins in a large bowl cut in a stick and a half of butter before mixing in buttermilk and one egg. The buttermilk combines with the baking soda providing the leavening. After an hour in the oven the bread, and dinner is ready. I was very happy with the results of the dinner, everything tasted great and the different items went together well. I was somewhat in disbelief that I've never had a dinner like this, growing up I always hear of friends' St. Patrick's Day dinners and they never described it as anything special. I can now say that I've had corned beef and cabbage and I'm definitely a fan, I might even make it part of my own tradition every year.